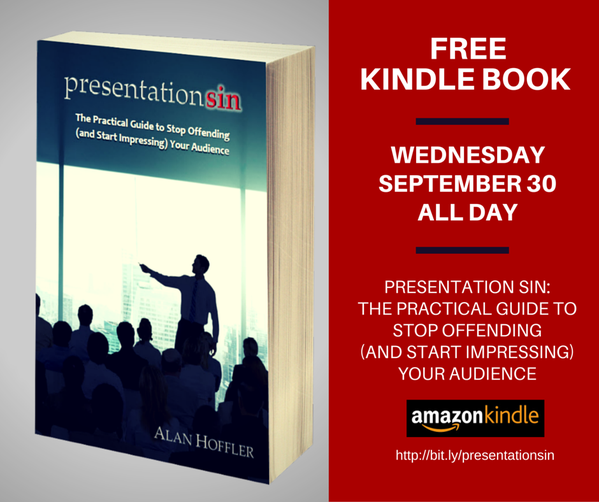 Today (September 30) you can download Alan Hoffler’s new book Presentation Sin for FREE on Kindle. Alan is a fantastic speaker and communications coach and trainer and owner of MillsWyck Communications. I took his Powerful, Persuasive Speaking and Powerful, Persuasive Content workshops a few years ago and became a convert to his approach. After years of freaking out over public speaking I became more comfortable on stage and more in tune with my audience. I also use his audience analysis and content development approaches in my writing. Will a book make you a good speaker? Not on its own—you still need to practice. But this book will set you on the right path. And if you ever have a chance to take Alan’s workshops, by all means do! Presentation Sin: FREE Sep 30! ← Need some inspiration, creators? Thanks Karen! I’ll check this out. Hope you’re doing well. I recently celebrated my birthday woo hoo Harry!